“Strangers passing in the street, by chances two separate glances meet” – Pink Floyd, “Echoes”. 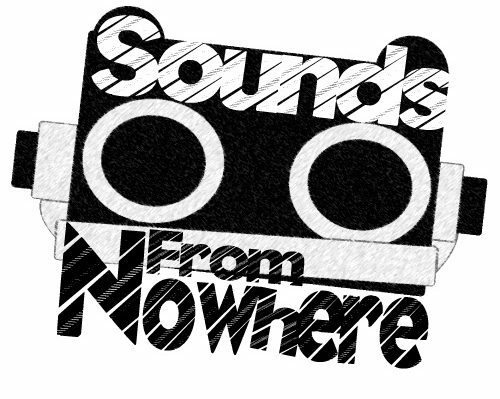 Motion picture soundtracks are a vital part of movies, and it’s often much more interesting when it’s somebody you know doing it. From Air scoring The Virgin Suicides to Eddie Vedder doing Into The Wild, there’s a long history of interesting collaborations between sound and film. 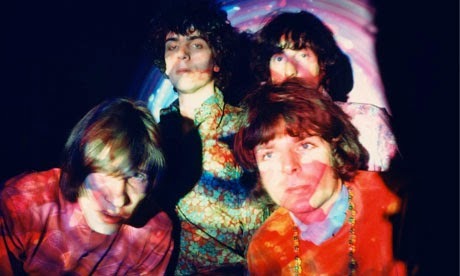 One example is more interesting than most, the old rock myth of Pink Floyd working with Stanley Kubrick. I’ve decided to finally delve into the whole myth, to see if there could be truth or whether it’s all just simple groupie talk. In 1967, filmmaker Stanley Kubrick was off filming is seminal space epic 2001: A Space Oddessy while around the same time, Pink Floyd were set to release their debut album. The thought of Kubrick wanting and asking Floyd to soundtrack 2001 is completely based of the possibility of Kurbick even knowing who they were. It’s impossible to actually say for sure if Kubrick knew who Floyd was, however I believe the possibility is there since Floyd‘s album hit #6 in the UK charts in August 1967 and their space themed songs on the album would’ve likely aroused the interest of Kubrick. Roger Waters has said numerous times that Kubrick never talked to the band during this stage or even during the 1960s. This was backed by Kubrick‘s daughter and the other Floyd members. While Kubrick may have and most likely knew of Floyd during that time, he didn’t contact them for 2001. The odd part of the story, while Pink Floyd were never asked (but possibly considered) for the 2001 score, the suite “Echoes” featured on Meddle actually perfectly syncs up with the Star Gate sequence in the film, as if it was made for it. Moving past 2001: A Space Oddessy, somehow the Floyd–Kubrick connection stands firm and even moves past the “possibility” phase. 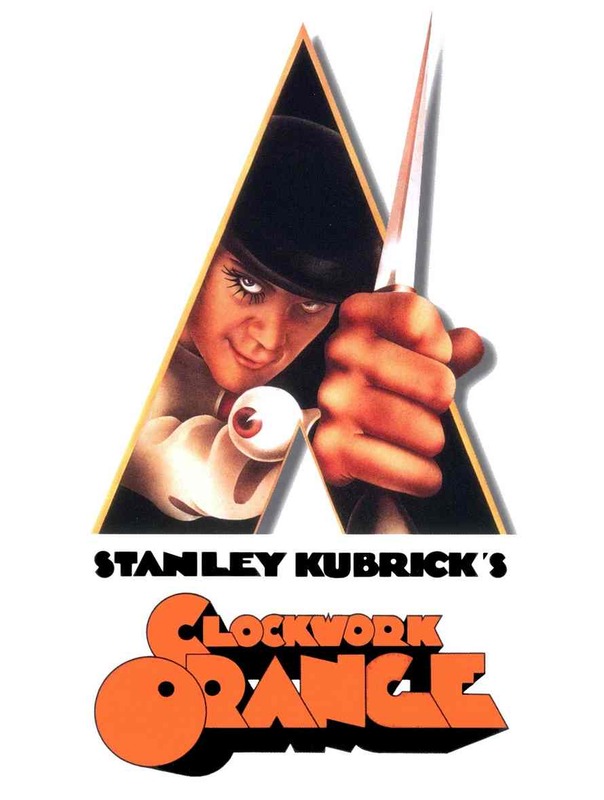 Moving onto A Clockwork Orange, Kubrick‘s 1971 ultraviolent epic. While surrounded in controversy, the film has become a cult classic and simply one of his greatest films. While filming A Clockwork Orange, Floyd and Kubrick pass for the first time. Kubrick contacted Roger Waters to use their grand 24-minute suite Atom Heart Mother (from the same titled album) for score use in A Clockwork Orange, as Waters told Great Lake in 1973 “He just phoned up and said that he wanted it. […] we said “Well, what do you want to do? and he didn’t know. He [said he] wanted to use it ‘how I want, when I want’.” […] and we said right away “Right, you can’t use it”. Pink Floyd refused to allow Kubrick to use “Atom Mother Heart” for A Clockwork Orange, in the first and one-of-two times they’ve spoken (that we can confirm). However, in reference to Floyd rejecting Kubrick, Kubrick may have thrown in Atom Heart Mother anyway. 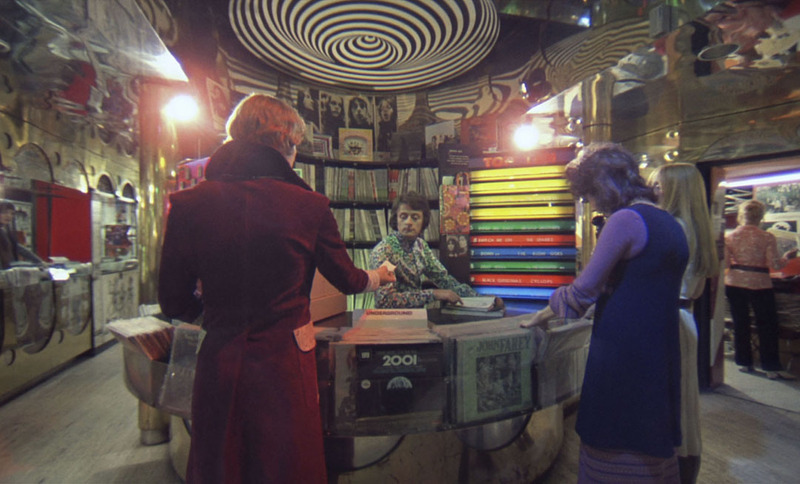 Seen in the still above, taken during the scene where Alex walks around the Chelsea Drug Store, seen on the top shelf is Pink Floyd‘s 1971 album Atom Heart Mother. Unsurprisingly, on the bottom shelf you can see the soundtrack to 2001: A Space Oddessy. While the meticulous Kubrick likely didn’t put the albums there himself, he likely loved that they were in the same shot, and that Atom Heart Mother can be seen anyway. In 1992, Roger Waters released his third studio album Amused To Death. The album is sci-fi inspired, but primarily inspired by Kubrick‘s 2001. Waters asked Kubrick to use HAL‘s dying monologue heard in the 1968 classic yet Kubrick refused Waters use. Kubrick cited that if Waters used it then several others would (meanwhile, HAL had already been heard in hip-hop’s sampling world). In retrospect, it’s very possible that Kubrick may have held a grudge with Waters and denied usage simply because of Atom Heart Mother. Rogers instead used a similar voice, while once Kubrick had died, Waters made the decision to use the HAL sample during live shows. In closing, the idea that Pink Floyd was asked to score 2001: A Space Oddessy is very very improbable. However, in the only two confirmed interactions of Kubrick/Floyd, the filmmaker was denied usage of “Atom Heart Mother” and in the other Waters was denied usage of HAL.